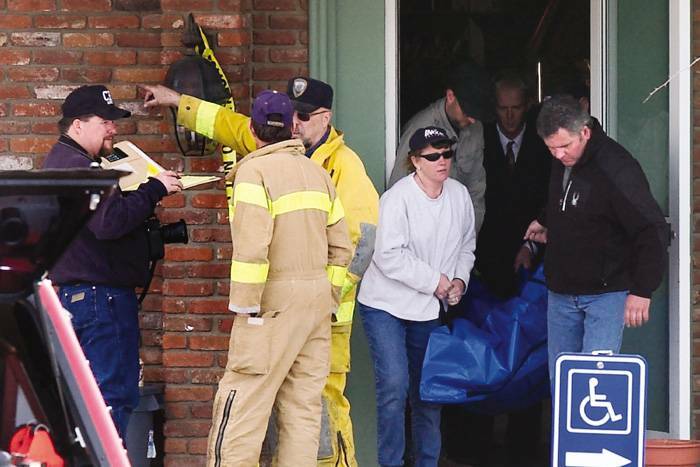 The body of a man is taken from the Aspen Country Inn as Colorado Bureau of Investigation agent Jerry Means, far left, discusses an apparent arson at the senior housing complex with local fire officials. Aspen Times photo/Paul Conrad. A man who was scheduled to be evicted from his apartment at a local senior housing complex apparently hung himself early Monday after setting fires that forced residents to flee the complex in the middle of the night.Robert W. “Bill” Seawell was found dead in his apartment.”Basically, that’s the premise that we’re operating under right now as far as who started the fire,” said Aspen Police Sgt. Steve Smith.An autopsy is scheduled for today.Seawell, 69, was a resident at the complex and his unit was the most seriously damaged in the fire, Smith said.He was the subject of an eviction hearing in Pitkin County Court last week and several angry residents of the complex alleged he was dealing drugs from his apartment, though authorities would not comment on that allegation. One tenant complained that police had not responded to reports of his activities.According to a press release issued late Monday afternoon by the city of Aspen, Seawell was being evicted for unpaid rent and “significant damage” to his unit. The sheriff’s office was scheduled to meet with housing officials to follow through on the eviction yesterday at 1 p.m. It was one of two ordered evictions at the complex, said Maureen Dobson, director of the Aspen-Pitkin County Housing Authority.Instead, all residents of the Aspen Country Inn were forced from their apartments by the fires and ensuing investigation. No one else was hurt, though several different blazes were set in the two buildings that comprise the complex, according to Aspen Police Detective Jim Crowley.Local police and fire officials, along with an agent from the Colorado Bureau of Investigation accompanied by a dog trained in arson investigation, spent much of yesterday probing the scene.The fires started at multiple points and it appears an accelerant was used to help fuel the blazes, Crowley said. Residents of the building also reported smelling natural gas and authorities said they believe gas lines were tampered with.”That guy was planning on blowing all of us up,” said one tenant who asked not to be identified. “I’m very upset,” she said. “This could have all been prevented.”The tenant said she had complained to police about Seawell’s suspected illegal activities, but to her knowledge nothing was done.Tenants return homeMost of the 40 units at the Aspen Country Inn were unaffected by the fire and residents were let back into their apartments Monday afternoon.There was fire damage in a basement storage unit in the west building and Seawell’s apartment in the east building, as well as in a common lobby area and an office in the east building, authorities said. The blazes triggered the buildings’ sprinkler system where heat was detected. The fire department turned off gas to the buildings, Crowley said.